Highly regarded as a shade-tolerant ornamental, beautifully variegated Cuban Oregano is used as a culinary herb in many parts of the world where temperatures are mild and frost rare. It is easy to grow here, but should be treated as an annual, since it won’t survive cold weather. It does very well in containers and is a stunning accent to other plants. Cuban Oregano is truly a heat-loving, drought-tolerant plant, which performs beautifully in the general landscape or as a feature in the herb garden. 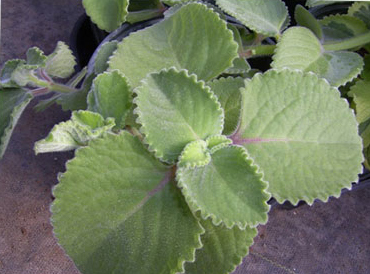 Cuban Oregano is known in some areas as Spanish Thyme or Indian Borage, but it has the same fragrance as a fine oregano. 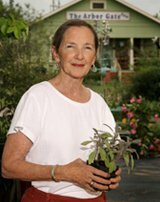 It grows to a height of 1 1/2 to 3 feet tall, and has a tendency to spread to about 3 feet wide. Pruning to the shape and size you want only improves its looks. The large fleshy leaves of Cuban Oregano have numerous culinary uses — as a seasoning for soups and stews, and for an appetizer, a large leaf can form a base for numerous flavored cheese-type spreads.